some of our submarine models have fin planes and it would be consequent to make them working by radio control. To control them independently from the other planes you need an additional servo and a force transmission to the fin planes. In general this raises the difficulty how to get this transmission sealed and make it easy to decouple as the fin is normally mounted on deck and for getting access to the interior of the pressure hull (or the WTC) you would have to decouple the plane drive normally. I suppose that there are already suitable solutions found by other modellers and that they are doing the job well. 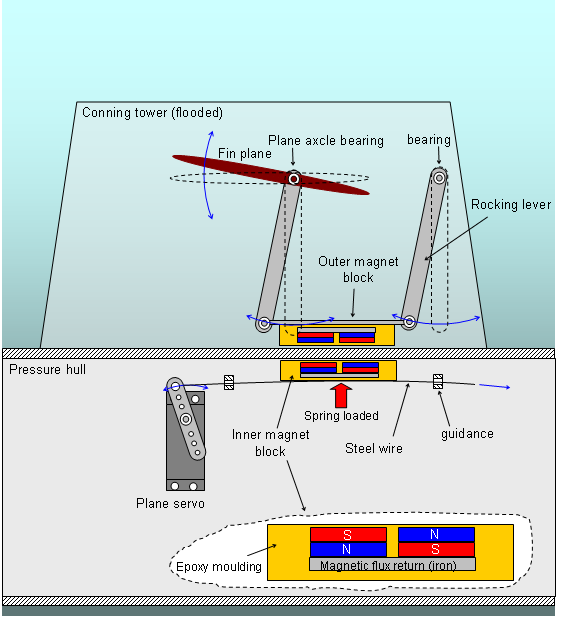 For myself I have found a solution that uses magnetic coupling between the servo inside the pressure hull and the fin planes outside and I have implemented this coupling in my class 212A submarine model (see sketch and photograph, I hope the pictures will speak for themselves). 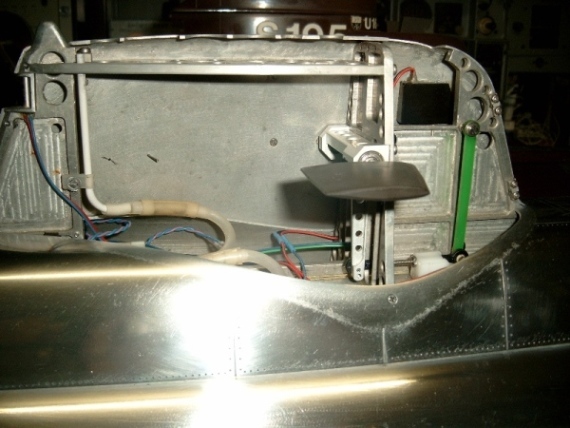 Due to the magnetic coupling it is easy to strip-off the pressure hull tube (with the conning tower on it) from the inner technics rack that contains the servo – and vice versa when reassembling the parts. And this solution does not require any seal because transmission is provided by magnetic force just through the pressure hull tube wall. That is always tight and that is important for a submarine when “rolling in the deep”. Maybe this might be an interesting alternative also for other submarine modellers among us. I was impressed by the magnetic linkages which Harry B was also using at Edinburgh this Sunday. great ideas, just a quick question. If I place these magnets in the WTP what are the chances of their magnatism interfering with the receiver, leveller etc. for a few days I was not online so my reply comes with a delay. Concerning your question there is no need to worry because the coupling magnets for itselves have a constant (static) magnetic field. If they are not moved there will not be any electromagnetic induction of interfering voltages in electric circuitries. In practice there is also no effect of the static stray field to magnetic components inside the receivers (ferrite cores of filter inductors). When in motion the magnets can of course induce voltages in conductor loops (that is a basic physical law), the magnitude depends upon the loop area, the speed and the magnetic field strength (magnetic flux density). But as the speeds and the other parameters are really low you can really forget about these theoretical considearations. If you think about magnetic couplings rare earth magnets can provide strong coupling between the inner and the outer magnet groups. Butwhen using rare earth magnets you should take care and seal them carefully from water by the moulding as the magnetic material is very sensitive to corrosion in water. Normally these magnets have a nickel plating that makes them shine in silver but this nickel plating is rather thin and may get some very fine cracks (especially when you play with the magnets and let them hit together) so that water can penetrate. Ferrite magnets are an alternative; they are relative weak but complete immune to corrosion. If you have an application where magnetic couplings were suited I can only encourage you to try and make your own experiences. many thanks for your detailed reply, I am building a tube at present and will use magnets to attach dive planes etc. When I get arround to that part, I'll put some pictures here showing my attempts.